Alibaba has announced the collaboration with BMW and Intel at the Consumer Electronics Show 2019 in Las Vagas, the US. Developed by Alibaba A.I. Labs, voice assistant Tmall Genie, will be available in-car to BMW customers in China by end of 2019. 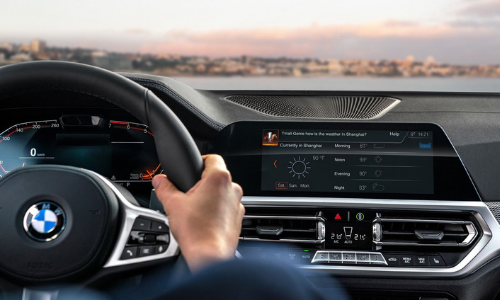 It follows the integration of BMW Connected into Alibaba’s Chinese ecosystem, allowing BMW customers with a Tmall Genie-compatible device at home to access their digital lives during their journeys. BMW customers in China can use Tmall Genie to dive into Alibaba’s consumer centric ecosystem, such as the latest movie listings, favourite playlists or the weather at their destination. They can also access all the information the Tmall Genie has at its fingertips through its voice activated controls. The Tmall Genie also displays text and images in the BMW Display Screen. “We launched the ‘AI+Car’ solution last year, aiming at providing more intelligent and connected experience for Chinese car users through Tmall Genie’s AI powered voice interaction and service capabilities for cars,” said Miffy Chen, vice president of Alibaba Group, head of Alibaba A.I. Labs. Tmall Genie is a smart speaker in China with over five million units sold since its launch in 2017. The collaboration marks BMW as the first premium carmaker to launch Tmall Genie to market. Apart from BMW, Alibaba has also partnered with Intel to develop the first and AI-powered 3D athlete tracking technology for the Tokyo 2020 Olympic Games, providing athletes with new training data and analysis while elevating the viewing experience for fans around the world. Powered by Alibaba’s cloud computing capability as well as Intel’s hardware and deep-learning algorithms, the 3D Athlete Tracking Technology will utilise regular video cameras to create a 3D “mesh”, which allows coaches and trainers to analyse intricate, real-time, biomechanical data of an athlete’s movements. By using the technology, coaches and trainers will be able to help athletes modify and enhance their training to ultimately improve their performance, according to Alibaba. In addition to the benefits for athletes, the technology will give fans insights into how world-class athletes perform. For example, broadcasters will be able to analyse, dissect and re-examine highlights during instant replays at the Tokyo 2020 Olympic Games. The collaboration is not the first move by Alibaba to involve in the Olympic games. In September 2018, Alibaba and Olympic Broadcasting Services launched OBS Cloud – a broadcasting platform operating entirely on the cloud to support the heavy content production and delivery workflows experienced by Rights Holding Broadcasters covering the Games. CEO Kristian Lee told A+M that agencies should aim to address more holistic aspects of a marketer's challenges that advertising by..
A case of unfortunate ad placement? Harian Metro found itself in a bit of a predicament when thousands of Malaysians, dressed in black, gathered peacefully in protest..
Neutrogena’s new digital assistant guides users through a step-by-step process to help determine their skin’s needs, and offer per..